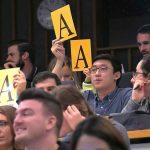 During the past 17 months, George Blackall, director of the Office for a Respectful Learning Environment, has collected 758 narratives from College of Medicine students hoping to recognize someone who both challenged and changed them. 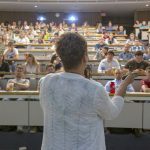 The program, Blackall says, is helping to make the College of Medicine an even better place for tomorrow’s medical professionals. 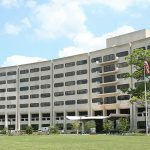 Dr. Timothy Mosher, chair of the Department of Radiology at Penn State College of Medicine, developed a new medical school course aimed at identifying systemic causes of misdiagnosis-and how to prevent them. 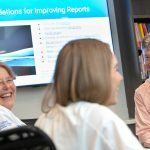 Penn State College of Medicine offers a new class to teach medical students about health systems and how they will impact the way physicians will practice medicine. 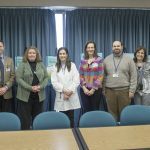 The Pennsylvania Psychiatric Institute and Penn State Health Milton S. Hershey Medical Center’s Department of Psychiatry are partnering to offer a Public and Community Psychiatry Fellowship to address the growing shortage of psychiatrists. Being selected to host the American Medical Association’s (AMA) “Accelerating Change in Medical Education” conference both acknowledged Penn State College of Medicine’s hard-won expertise in health systems science and enabled its leaders to share strategies for revolutionizing medical education. 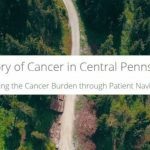 Penn State has launched its first cancer-related Story Map, “The Story of Cancer in Central Pennsylvania.” The interactive geospatial map illustrates the extent of the cancer problem in the region. 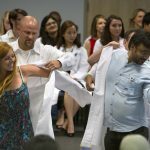 Seventy incoming graduate students pursuing a master’s or PhD degree in the public health or biomedical sciences at Penn State College of Medicine took part in the annual Graduate Student Oath Ceremony on Aug. 17. 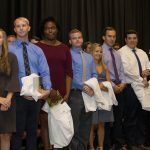 First-year Penn State College of Medicine medical students, including those pursuing their MD and MD/PhD degrees, received their first white medical coats on July 27. 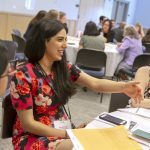 Penn State College of Medicine welcomed 152 new medical students from both its Hershey and University Park campuses with orientation from July 10 through 13.